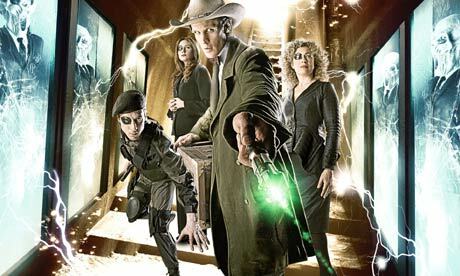 Diggin' to China: BAD WOLF: " The Wedding of River Song" or GRIPES, GRIPES EVERYWHERE. BAD WOLF: " The Wedding of River Song" or GRIPES, GRIPES EVERYWHERE. What’s the term for a simultaneous feeling of excitement and disappointment? I’m left with whatever it is after having stewed over what I'd write for my review of “The Wedding of River Song”. 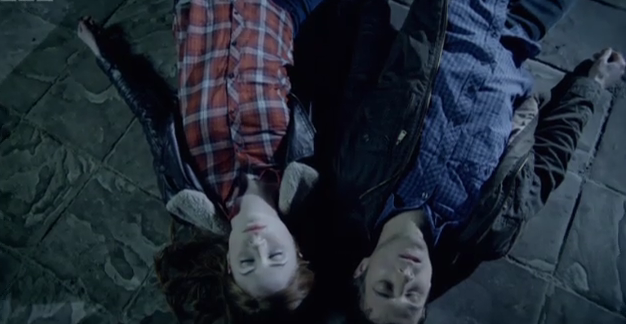 Moffat’s ability to leave the audience wanting more is not to be underestimated. So too is his ability to explore the motivation and real elements of a character, a talent I feel has been neglected for the major part of series six. Moffat has always been a writer renowned for his ability to balance multiple story elements at once, and while most times this is done as well as most would imagine it could be I feel like a major element of the current Doctor Who arc has been left unattended and overlooked. The focus of the second half of this series was the death of the Doctor. Who kills him? How and why? IAs interesting and engaging as those questions were, I felt like some other important elements were ignored. We had an excellent series halfway ender in “A Good Man Goes to War”. Plenty of fun elements introduced, including The Doctor’s effect on his travelling companions and the birth of Amy and Rory’s baby. Upon the return of the series I expected to join the crew travelling through time and space and hunting down the captured child and the organization behind it. Instead we got a bunch of stand-alone adventure episodes in which the writing seemed incongruent and unreasonable. Instead of looking for Melody/River it seemed like they tried sweeping the storyline under the rug by saying, “Oh she’ll be okay because we know she’s River”, which is not only poor form writing wise, but it speaks very negatively of Amy and Rory’s characters and makes them look like bum parents, so much so that it nearly un-writes everything we grew to know and love from the characters introduced in series 5. As a mother is Amy Pond as strong a character as the writing would have us believe if we see her acting how we do? For god’s sake Amy had a child and lost it to a bunch of cult members who want to turn it into a killing machine. If Amy can rip time apart to get back to Rory where is that same will to reunite with her lost and very much in danger daughter? There isn’t even any attempt to explain it. We see the same Amy whine and complain about 30 years of waiting for Rory and the Doctor in “The Girl Who Waited” and while that episode was pretty amazing it still overlooked the fact that poor Rory waited two thousand years for her and the Doctor. It’s either very poor form or Moffat’s got something planned, but with the season ending on somewhat of a ‘resolution’ to the mystery of River and her origins I’m puzzled and concerned as to how they’ll bring these ideas up again and fix the huge hole left in the plot. Perhaps I’m still ragging on the story too soon and Moffat will wrap the loose ends up later, but what I expected and what I got were very different. Yes the Amy and The Doctor schtick is cute but you can’t try to make dynamic plot changes without changing the characters involved, it’s just careless. Alternate title for the series six finale. Now let’s talk about the things I enjoyed about the episode: The question, the Fall of the Eleventh. Exciting prophecies and story lines being set up for the next series, a very clever and satisfying hook for Moffat to tie in the longest running question in the Who universe to entice us to keep watching. Learning more about the Doctor’s origins will definitely keep me coming back every Saturday rabid with anticipation, however these hooks don’t mean much if Moffat does not address the obvious flaws. It’s tricky to predict what’ll happen but with the 50th anniversary approaching there’s no way Moffat doesn’t have a few tricks up his sleeve. So here’s my wish list: First and foremost, a reasonable resolution to the Doctor’s conscience and to the River Song/Ponds story. To see Jack Harkness and/or Torchwood involved in the Moffat/Matt Smith story, and perhaps an appearance from a past Doctor or Doctors. Even though I’m not fully satisfied with this series’ end I have learned that with Moffat all good things come to those who wait, and wait I shall, like Amy Pond for her raggedy Doctor, and so shall you. Hopefully I’ll be back here writing reviews for the next series. In the mean time I might be popping in and out to give you the scoop this or that. 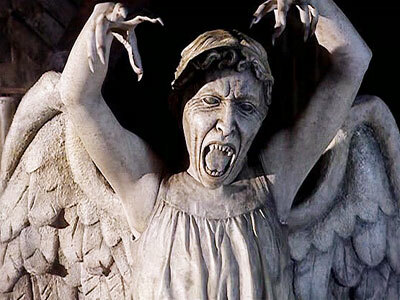 Till then, have a great Fall and don't blink.